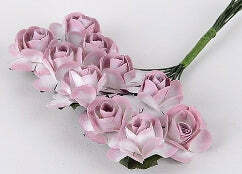 Roses are a multi-petals flower that is available in a collection of colors. The flowers used to increase grace and splendor to your party. At BB Crafts, we offer our paper rose flowers, which is considered as the ideal product for the floral arrangements, wedding decorations and much more. So, with our premium quality of paper flower bush, you can offer a stunning look to your decorations. You can buy these paper rose flowers from our website that are characterized by widespread ranges of colors, sizes, and patterns at very reasonable prices. Flower size that is available: 12 inch x 12 inches. Check out our fun roses facts that are also available for kids for their craft projects. These days, the bunches made from mini paper rose flowers are also in high demand and make a perfect offering to the newly wedded couple.